Of the four states of matter, gases are the hardest to pin down. Gas molecules move quickly and wildly and don't like to be confined. When confined, heat and pressure build in the container, and it doesn't take long before the gas blows the lid off the place, literally. Luckily, gases are superficial. Provide them with an attractive internal surface area, and they'll pin themselves down in no time. No, it's not love at first sight, it's adsorption. "Adsorption is the processes of gas pinning to the surface of another material—the inside walls of a container, for example," says Chris Wilmer, assistant professor in Pitt's Department of Chemical and Petroleum Engineering. "When adsorption occurs, the gas molecules stop bumping into each other, reducing pressure. So, by increasing a container's internal surface area, we can store more gas in less space." Dr. Wilmer directs the Hypothetical Materials Lab, where he and his research group develop new ways to store, separate, and transport gases. They recently published their study "Thermal Transport in Interpenetrated Metal-Organic Frameworks" in the American Chemistry Society Journal Chemistry of Materials. The issue's cover also featured an image designed by Kutay Sezginel, a chemical engineering graduate student in Dr. Wilmer's Lab. 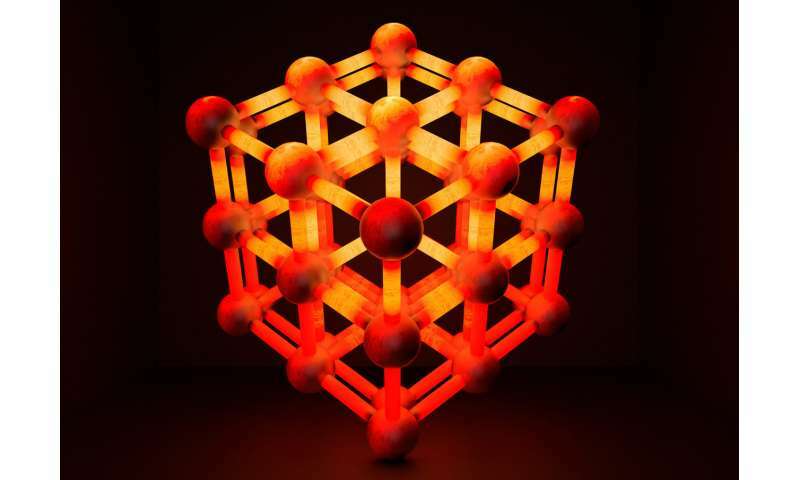 It depicted interpenetrated metal organic frameworks or MOFs. MOFs are a promising class of porous materials, made of metal clusters bound to organic molecules. Discovered fewer than two decades ago, MOFs help rein in gases because their porous nanostructure has an extremely high surface area and can be custom engineered to be particularly sticky to certain gas molecules. MOFs are used for a variety of functions including gas storage, gas separation, sensing, and catalysis. In the study, the researchers discovered that MOFs can dissipate even more heat from confined gases when they are woven into each other or "interpenetrated." In fact, parallel, interpenetrated MOFs can cool off gases roughly at the same rate of two MOFs individually. In other words, gases don't mind close quarters if those quarters are MOFs. More efficient gas storage could lead to new possibilities in sustainable energy production and use. Oil remains the preferred power source for most transportation vehicles, but natural gas is a cheaper, more abundant, and cleaner alternative. Compressed natural gas tanks are too heavy and expensive to replace traditional gasoline tanks, but adsorbed natural gas tanks are both light and cheap. A MOF tank can store same amount of fuel as typical gas tanks but with a quarter of the pressure. That's only one potential application. "Medical oxygen tanks, storing hazardous gases from semiconductor manufacturing, and technologies that aim to capture, separate, and store carbon from the air can all benefit from MOFs," says Dr. Wilmer. "We believe MOFs have the same potential impact on the 21st century as plastics did in the 20th." "When confined, heat and pressure build in the container, and it doesn't take long before the gas blows the lid off the place, literally. " I don't think that liberal arts majors should be writing about science. The University of Pittsburgh needs to vet their publicity department.